Home / Blogging / WordPress vs Empower Network – Which Blogging Platform Is Right For You? I’ve seen several discussions pop up in the forums lately from people asking which blogging platform is better. Specifically, people are asking about WordPress vs Empower Network so I thought I would share my knowledge and experience with both platforms and hopefully help some people get off on the right foot with your blog. First a little bit of history so we can make sure everyone understands what we are comparing. WordPress just celebrated their 10th anniversary this year. It’s a free blogging platform which accounts for the huge volume of users. There are two ways to use WordPress. Either hosted for you on WordPress.com or by downloading the WordPress software and installing it on a host server using your own custom domain name. Since WordPress has been around for a while now, and it’s free for anyone to use, there have been thousands of plugins and themes come out over the past decade. Plugins for just about anything you can imagine. Both free and paid plugins and themes. Empower Network, on the other hand, launched its blogging platform back in late 2011 and originally used the WordPress platform. Recently, however, in October of 2013, Empower Network launched what they call ENv2 (version 2.0) which is the culmination of a $3 Million dollar proprietary blogging platform designed specifically for people who market something with their blog. In other words, anyone with anything to sell. Be it products, services, a brick and mortar business like a restaurant or retail store, etc. I’ll talk more about some of the features that make ENv2 a marketer’s platform of choice in a minute. ENv2 was also designed with something else in mind. Knowing that WordPress was obviously the blogger’s choice but also that tens of thousands of people, if not millions of people, were never able to get their WordPress blog off the ground because of the technical expertise required or because of the cost involved when hiring out the installation and design services, or they found the learning curve to be too steep, the creators of ENv2 built this new platform with Ease of Use being a top priority. What they coined as being the one and only “Grandma-Proof” blogging platform. No offense intended toward Grandma’s out there. If you’ve never installed WordPress before, there is a nice installation guide available from WordPress.org where you go to download the software, but it is still way beyond the average capacity for the technically challenged. And that’s just the installation. Once you have WordPress installed you then have quite a few more things to take care of before you can have a blog up and running and ready to start blogging and driving traffic. There’s the configuration stage, then finding the right plugins to handle your specific needs, then of course finding the right theme and installing it. And each plugin will likely need to be configured before it can be used. Themes have to be configured as well and hardly anyone uses the default graphics or header and footer images with a theme whether it’s free or cost something. Many people attempt to do all those things themselves at first and then eventually give up and seek out professionals they can hire to do the job for them. Depending on the scope of your wants and desires for your new blog, all those services can cost anywhere from $500 to more than $5000. WordPress isn’t looking very close to being Free anymore, is it? There are millions of WordPress blogs online today. They haven’t really had much competition until now. And there are some rather obvious advantages to using WordPress, at least in a self-hosted environment. Like the fact that you own your blog. Nobody can take it away from you. Unless of course you don’t pay your web hosting bill. The customization options are plentiful. And like I said before, if you need a specific type of plugin to do something unique or unusual, chances are there is a plugin available for exactly what you want to do. It may not be free but you can probably find it. Empower Network’s blogging platform is still in its infancy stage right now. Having used both versions – before when it was based on WordPress and now with the new platform – and having a number of years experience using WordPress, I’m quite surprised and pleased at the level functionality I’ve experienced with ENv2. I expected some bugs, and there are some, and maybe a lack of features with the initial release version. Over the past couple of months since the launch of ENv2… actually less than 60 days as of the time I’m writing this article, I think most of the bugs have been fixed and I’m watching new features added on a weekly basis. Let me get into a little more details for you about ENv2 and what makes it so different. Empower Network’s new blogging platform is intended to be point and click easy from Day 1. Saving people headaches and frustration from the git go so they can have a nice, somewhat customized blog, up and running in as little as a couple of hours. With that goal I believe they have achieved 100% success. When you sign up for the ENv2 blogging platform, you pay just $25 a month with no setup fee. And get this… that includes hosting for your blog and any images you upload. Although there is an optional Media Hosting addon for $19.95 in case you want to host your own videos and audios. In the online marketing industry it’s not wise to rely on YouTube to host all your videos because it’s too easy for someone to flag one of your videos, with or without a valid reason, and get your YouTube account shut down. Permanently. Google owns YouTube and apparently they do not deem it necessary to dedicate man-hours to investigating the validation of video flagging. It’s much easier for them to take the Flagger’s on their word and shut the account down. Of course that’s your call. The Media Hosting option is just that… Optional. The instant you pay your $25 your blog is set up and ready to use. No technical skills necessary. No installation of software or plugins to worry about. Customizing your blog is easy as well. Click a button and get access to color pickers to set the colors for just about any part of your blog. Titles, sidebar text, background, etc. Click to add new menus or pages to your blog. Click to change your profile picture or your header image. By the way, you can go to Fiverr.com and have a nice custom header image made for 5 bucks. There’s a default banner in the sidebar that you can click on to replace with a banner and link of your choice. Remember, this was made to be simple so you can start blogging immediately. Oh yeah, it was also made for something else, right? Specifically to help people sell whatever they are selling. 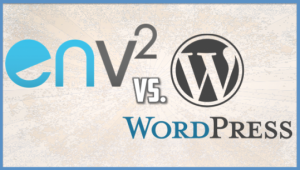 So what is it about ENv2 that makes this blogging platform easier for marketing? Quite a few things. I don’t have enough room here to give you detailed descriptions without turning this into a novel. Integrated SEO Features: For both your blog and all its pages and for each blog post or article. Fill in the boxes or use the default content that the system fills in for you based on your blog articles. Very clean and fast and you don’t need to be an SEO expert. Viral Exposure Features: A built in Commenting system not only engages your readers but the system tracks those comments so you can see which of your posts are Most Controversial or have the most Likes. Integrated social sharing with other social networks. A ReBlog button – this is so cool. If you see a blog post you really like you can click the ReBlog button and post a duplicate copy of that post, including images and videos, add in your own subtitle and description or content, and instantly publish it to your own blog. Integrated Mobile App: I saved this for last on purpose. To me, this is an amazing feature. The mobile app for your Empower Network blog is included for that same $25 a month cost. Available through iTunes and the Google Play Store (for Android systems) the mobile app allows you to blog from anywhere in the world using your smartphone or tablet. Shoot a video using your smartphone of an interview with a client or customer or to show off a certain product you want people to know about or even better, of you using that product. Then click a button, type in a title and optionally a description, and boom! Your blog post is uploaded and ready for all your viewers to check out within seconds. You can of course post a regular text blog and even add images from your mobile app as well. Now you know what the differences are and what created the birth of the new Empower Network blogging platform. Personally, I was excited to see so many people asking which is better. Why? Because WordPress has been around for 10 years and ENv2 is fairly new. Yet it is already a strong contender. There are always advantages and disadvantages that one must weigh when comparing two products or services to one another. Then of course you have to ask yourself what it is that you want. What’s important to you and what’s not so important? WordPress will be around for a long time. So will Empower Network. Here are some bullet points to think about when making a decision on which blogging platform to go with. WordPress supports full customization. Any way you can think of to customize your blog… it can be done with a WordPress blog. ENv2 currently has limited customization features but it can still be very customized. You are welcome to take a look at my Empower Network blog HERE to see how I made it look a lot like my personal blog. Yes, I have both platforms still and I use each blog for different purposes. Empower Network is already adding features on a weekly basis. Sometimes daily. They are improving things probably faster than you can get feature requests submitted to them. That’s a good point to make though. Since ENv2 is a proprietary platform, they take their clients’ wishes very seriously. If there’s a plugin you’ve seen or a feature you would like added they have a department set up specifically for that. If you are technically challenged, like so many people are, you will appreciate the simplicity and instant set up you have with the Empower Network platform. If, however, you like to get your hands dirty, so to speak, then you will probably enjoy a self-hosted WordPress solution better. If your budget is a strong determining factor, you get an awful lot for your money with the Empower Network platform. On the high end, paying $25 for the blogging system, $19.95 for the Media Hosting addon, and $5 at Fiverr.com for a custom header image, you’re still way under $100 and you can have a nice custom blog set up and ready to spread the word about in 2 or 3 days. Empower Network also offers 4 different training products designed to help business owners learn how to market their products or services on the Internet. When you’re ready to take the next step, that training could very well be the best investment you make in your business. The training is not just about blogging, although that part is covered extensively. If you want to get more sales and take advantage of your new Internet presence you need to learn things like – how to get traffic to your website, how to follow up with your prospects, how to build a subscriber list of customers (buyers) so you can get repeat sales, and a whole lot more. One last note and I will close out this very long article. 🙂 If you should decide to go with the Empower Network blogging platform, I’m sure you will be impressed. And when you are, it’s human nature to want to share a good thing with other people. Especially if you happen to know any other business owners or anyone who has a desire or passion that they want to spread the word about. Blogs are becoming one of the biggest and best social media platforms to ever hit the Internet and I don’t see that changing anytime in my lifetime. Empower Network has an affiliate program that pays you 100% commissions when you refer someone who purchases the blogging system or any of the training products. That means you only need to refer 1 person to cover your own $25 monthly cost. Anything after that becomes a new income stream for you. You can get more information about the blogging system and the other training products by Clicking Here. Or if you’ve seen enough and you’re convinced it’s well worth the $25 you can go get your new blog set up instantly by Clicking Here. Also, if you found this article to be informative or helpful in any way, please tell me in the comments section below. Give me some feedback please.